What do you do if your company has supplied intercoms systems to every venue for the last two Olympic Games, employs more than 150 people globally, has successful AV rental and radio distribution operations, and has a ball providing audio services to the Red Bull world series of air races? If you're Thomas Riedel, you don't lie back on the sands of some far-off beach and congratulate yourself on a job well done. 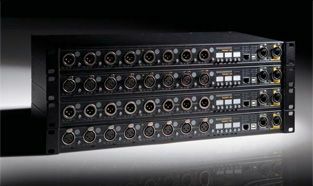 Last October, Riedel acquired Media Numerics, creator of the RockNet real-time digital audio network. cable in real time. Last March, Riedel demonstrated BestBoy, a system for the wireless distribution of AV content to videowalls, for the first time. And in October, the company hit the acquisition trail again, this time swallowing up Media Numerics, creator of the RockNet real-time digital audio network. So where is all this leading? "Media Numerics is in audio, while Mediornet was designed for video and data, and these things are coming together," said Riedel. "One thing they have in common is that they are real-time applications. We are not into WANs, supplying whole cities with networks. But we are very interested in supplying an infrastructure for production facilities, campus networks, and so on. A lot of industry energy is going into IP and WAN, but there is still a need for real-time communication." Riedel (in this case, Thomas Riedel himself) provides audio services to the Red Bull world series of air races. so we know that market pretty well. That department now has a great opportunity to demonstrate the Rock- Net product in a live environment." The company's products continue to find new applications this side of the Atlantic, everywhere from houses of worship to sports facilities such as General Motors Place, home of the Vancouver Canucks NHL hockey team, which took delivery of a multinode Riedel Artist digital matrix at the end of 2008. Thomas Riedel sees his company's experience of the broadcast and events businesses as crucial to its potential impact on the world of commercial AV. "If you have three or four sports arenas in one city, you don't want to have to move an OB truck from one to another—you want a single control network that links all the venues together so that the broadcast facility can stay in one place," he said. "And if you think of a modern theater or house of worship, RockNet allows you to have five or more nodes on the stage which then connect to FOH, a recording area, broadcast studio and so on. RockNet is more decentralized than any other product out there. There are some other systems that can offer up to eight nodes in their fiber network; we can do up to 100. That's a big difference!"